In the first phase out of nuclear power in a major economic power in the wake of the Fukushima Daiichi disaster, Germany’s Chancellor Angela Merkel Monday said her country would break with atomic energy by 2022, reiterating an earlier statement that was decided by her government a weeks ago. The complete phase out was hammered out by parliament in a session led my Merkel’s centre-right coalition. She said the decision marked a “fundamental” rethink of the future energy policy of the world’s number 4 economy. “We want the electricity of the future to be safer and at the same time reliable and affordable,” Merkel told reporters as she accepted the findings of an expert commission on nuclear power she appointed in March in response to the crisis at Japan’s Fukushima plant. “That means we must have a new approach to the supply network, energy efficiency, renewable energy and also long-term monitoring of the process,” said Merkel, whose popularity had suffered over her previous pro-nuclear stance. Merkel’s government initially floated the idea about phasing out nuclear power by 2022 last week. The Swiss government followed suit two days later, announcing it hoped to shut down its five nuclear reactors by 2034. The commission appointed by Merkel found that it would be viable within a decade for Germany to mothball all 17 of its nuclear reactors. Eight of its rectors have been shut down, seven of which – the country’s oldest – where taken off the country’s electricity grid as a result of the Fukushima disaster. The eighth is the Kruemmel plant, in northern Germany, which has been offline for years due to repeated technical problems. Six further reactors are to be shut down by the end of 2021 and the three most modern would stop operating by the end of 2022, said Merkel. In all, five reactors will have their engineered lifespans clipped by 10 years or more – a refreshing change for environmentalist for whom operational extensions are a constant headache. 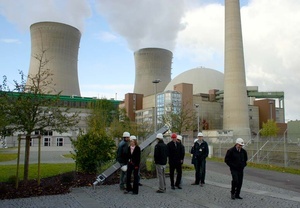 The confirmation of the phase out was welcomed by many environmentalists, while others called for Germany’s reactors to be shut down more quickly. Hundreds of thousands declared they would turn out next weekend for fresh demonstrations to demand this. “From 2022, Europe will no longer be at risk from nuclear accidents in Germany and the Germans will even be able to avoid some of the more serious problems of nuclear waste storage,” said Bellona nuclear physicist Nils Bøhmer. “Nuclear power generates huge amounts of long lived highly radioactive waste and there are currently no solutions anywhere in the world as to how to safely handle this waste for the thousand of years it remains dangerous,” he said. Vladimir Slivyak, co-chair of Russia’s Ecodefence group and an expert on European nuclear affairs, agreed. “With this decision, Germany is destroying a lot of myths about civil nuclear power,” first of all,the myth that nuclear power can be safe, even in developed country that has enough resources to modernize reactors,” said Slivyak. The decision to pull the plug on nuclear power came after a weekend when more than 100,000 people turned out in Germany to voice their opposition to nuclear power, an activist movement that has a long history in the country. Bellona’s Bøhmer said the decision dealt a severe blow to the competitiveness of nuclear power, which he predicts will be replaced by cheaper renewables in Germany. “This is a severe setback [for nuclear power], and will put it even more on the defensive, ” said Bøhmer. “Even before this decision the price of installed solar and wind energy was lower than that of new nuclear power plants,” said Bøhmer. “When Germany must now focus even more on renewable energy sources, nuclear power’s competitiveness weakened further,” he said. German environment Minister Norbert Roettgen announced the gradual shutdown early Monday after seven hours of negotiations at Merkel’s offices between the ruling coalition partners. He said the decision was “irreversible,” Agency France Presse quoted him as saying. Germany will have to make up a 22 percent shortfall in energy come 2022, but Roettgen insisted there was no danger of blackouts. “We assure that the electricity supply will be ensured at all times and for all users,” he told reporters. Slivyak was optimistic that the gaps would be closed by renewables. Yet Monday’s decision is likely to run into legal challenges from energy companies. But Slivyak noted that the real crunch will begin to be felt when Germany begins to shut down and decommission its reactors, deflating, he said, yet another myth that nuclear power is cheap.